I like to install interior plantation shutters for whole house. What would the cost be? There are many factors involved in pricing plantation shutters. Materials and quality being the most important, followed by the type of installation. You can purchase the shutters at your local home improvement store, or visit a blind specialist. $350 per window is not unusual for an installed shutter of average quality. Many times you’ll find the quotes are given on a per square foot basis where the installation by a certified installer will cost from $2 – $3 per square foot. Or they may quote installation on a per window basis – anywhere from $25 – $75 per window depending on the type of installation that is necessary. From a handyman’s perspective, if the client has purchased the shutters and they are on site, the installation can easily run at least 30 minutes per window. Thanks for sharing this great information. It helped us when making some decisions about who we purchased our blinds from. 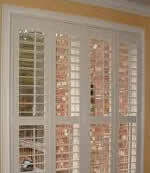 Yes, the cost of plantation shutters may be a little more expensive but they are well worth in…at least in my opinion.